FFA - CAIR calls Frank Gaffney Islamophobe, demands that corporations stop donating to the Center for Security Policy. CAIR calls Frank Gaffney Islamophobe, demands that corporations stop donating to the Center for Security Policy. CAIR is fighting to deny law enforcement the information they need the most to fight ISIS’s terrorist threat in the American homeland. The email for this article has been deactivated. Twitter and Facebook posts provided below. The Council on American Islamic Relations (CAIR) issued the following news release which announced they are demanding that several corporations stop financially supporting the Center for Security Policy. (WASHINGTON, D.C., 10/1/14)  The Council on American-Islamic Relations (CAIR), the nation's largest Muslim civil rights and advocacy organization, today called on defense contractors Boeing, General Dynamics, Lockheed Martin, Northrop Grumman, Raytheon, and General Electric to stop funding an organization headed by notorious Islamophobe Frank Gaffney. "Frank Gaffney has emerged as one of the DC-beltway's most outspoken critics of American Muslims, purveying conspiracy theories about the infiltration of the Muslim Brotherhood into the highest levels of the U.S. government and birther accusations about Barack Obama's eligibility to serve as president. But even while drawing criticism from civil rights organizations, Gaffney. . .has continued to find sources of funding for his organization, the Center for Security Policy, managing a budget of over $3.5 million in 2013." A copy of the Center for Security Policy's donor roll obtained by Salon lists six of America's largest aerospace and defense contractors as supporters of Gaffney's organization. "The document, which details contributions to the Center for Security Policy during the 2013 tax year, includes donations from: Boeing ($25,000); General Dynamics ($15,000); Lockheed Martin ($15,000); Northrop Grumman ($5,000); Raytheon ($20,000); and General Electric ($5,000)." "It is troubling that our nation's top defense contractors would endorse an anti-Muslim hate group by offering it financial support," said CAIR Department to Monitor and Combat Islamophobia Director Corey Saylor. Saylor notes that Gaffney is a key promoter of the bizarre conspiracy theory that Muslims in public service are infiltrating the government on behalf of the Muslim Brotherhood. Gaffney has questioned "whether Mr. Obama is a natural born citizen of the United States," claimed the Missile Defense Agency logo is part of a "worrying pattern of official U.S. submission to Islam," claimed an aide to Hillary Clinton was a secret Muslim Brotherhood operative, and was a key witness for the plaintiffs in a controversial lawsuit seeking to block construction of a Tennessee mosque. He has also promoted the false belief that President Obama is a Muslim. His staff attorney, David Yerushalmi, has advocated outlawing the practice of Islam in America and is the key promoter of anti-Islam bills in state legislatures nationwide. CAIR details Gaffney's and the Center for Security Policy's role in America's Islamophobia network in its report, "Legislating Fear: Islamophobia and its Impact in the United States." "We believe this letter provides more than ample evidence that the Center for Security policy is a problematic choice for any corporation that seeks to avoid involvement in anti-Islam bias." CAIR pressured the FBI in February 2012 to remove 876 pages and 392 presentations from their education resources that were offensive to Islamists. NPR reported: The FBI has completed a review of offensive training material and has purged 876 pages and 392 presentations, according to a briefing provided to lawmakers. CAIR pressured the FBI in June 2013 to stop their Most Wanted advertising campaign which helped the FBI gain information regarding the whereabouts of dangerous terrorists. CAIR pressured Illinois Governor Pat Quinn to ban anti-terrorism training expert Sam Kharoba from instructing law enforcement officers throughout the state. CAIR demanded that the Florida Department of Law enforcement (FDLE) ban anti-terrorism training expert Sam Kharoba from instructing law enforcement officers in the state. Although the FDLE declined to adopt the policy requested by CAIR no law enforcement agency in Florida has contracted Sam Kharoba’s anti-terrorism training services following CAIR’s demands. CAIR pressured Lane Community College to fire a professor for attempting to teach the truth about Islam in a course titled What is Islam. CAIR pressured Brandeis University to cancel speaking engagement and human rights award planned for Ayaan Hirsi Ali because of her criticism of Islamists. CAIR pressured several networks to censor numerous programs including "Alice in Arabia," "Executive Decision," "24," "The Siege," "True Lies," "Rules of Engagement," "Obsession," "The Third Jihad," "Jihad in America," “Tyrant,” and "The Sum of All Fears." Ghassan Elashi, founder of CAIR’s Texas chapter, in 2009 received a 65-year prison sentence for funneling over $12 million from the Islamic charity known as the Holy Land Foundation to the jihad terrorist group Hamas, which is responsible for murdering hundreds of Israeli civilians. Mousa Abu Marzook, a former CAIR official, was in 1995 designated by the U.S. government in 1995 as a “terrorist and Hamas leader.” He now is a Hamas leader in Syria. Randall Royer, CAIR’s former civil rights coordinator, in 2004 began serving a 20-year prison sentence for aiding al-Qaida and the Taliban against American troops in Afghanistan and recruiting for Lashkar e-Taiba, the jihadist group responsible for the 2008 Mumbai jihad massacres. Bassem Khafagi, CAIR’s former community relations director, was arrested for involvement with the Islamic Assembly of North America, which was linked to al-Qaida. After pleading guilty to visa and bank fraud charges, Khafagi was deported. Rabih Haddad, a former CAIR fundraiser, was deported for his work with the Global Relief Foundation (which he co-founded), a terror-financing organization. 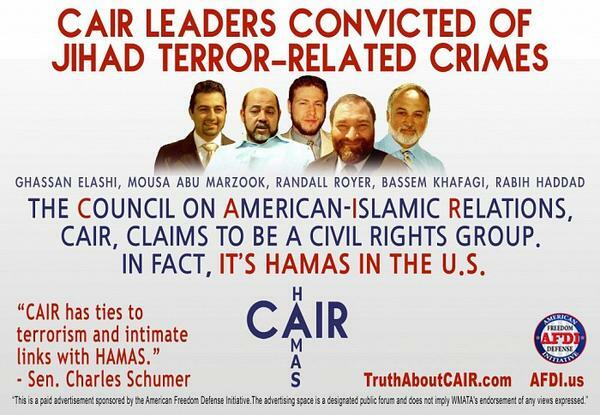 CAIR is an unindicted co-conspirator in a Hamas terror funding case--so named by the Justice Department during the HLF trial. CAIR’s agenda to dumb down law enforcement and the public can only weaken the national security of the United States of America. The one asset that America needs most for national security is adequately trained law enforcement in the area of Islamic terrorism given ISIS’s heightened threat to the homeland. Yet, the Council on American Islamic Relations is pressuring every law enforcement agency they can to dumb down their knowledge on Islamic terrorism. Florida Family Association has prepared an email for you to send to thank the officials at Boeing, General Dynamics, Lockheed Martin, Northrop Grumman, Raytheon, and General Electric for supporting the Center for Security Policy. For contact information please click here.